Most manufacturers offer a standard warranty against defects. Such warranties typically cover the product for at least one year from the date of invoice. To look up basic warranty information, find the product using one of our searches and click on the product name to bring up the product's information. Warranty information is listed under "Product Details" near the bottom of the page. If a product proves to be defective during the covered period, please contact our technicians via live chat on our website at www.cablecables.com during the hours of 9:00AM to 5:00PM EST Monday – Friday and 9:00AM – 3:00PM EST Saturday and Sunday. You are entitled to the manufacturer's limited expressed warranty, if any, that accompanies the product. 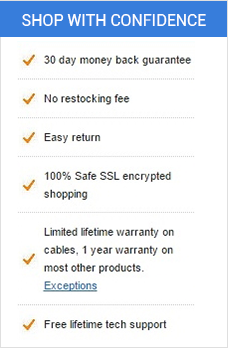 Cable Cables makes no additional or independent warranty. All other warranties, expressed or implied, including the warranties of merchantability and fitness for a particular purpose are disclaimed. Cable Cables shall under no circumstances be liable for special, incidental, or consequential damages including loss of profit, even if it has been advised of the possibility of such damages; the maximum liability for all direct damages, if any, arising out of any action shall be limited to an amount not to exceed the purchase price of the product. 1. (a) Cable Cables warrants that it has good title to the hardware Products it sells, and that it has proper authority to license the software products it distributes. 2. (b) Cable Cables does not warrant the performance or integrity of any Product, but merely passes through to the Customer whatever end-user warranty the manufacturers or software publishers provide with their respective Products. 3. (c) YEAR 2014 DISCLAIMER. Cable Cables ENCOURAGES ITS SUPPLIERS TO MAKE THEIR PRODUCTS AND SERVICES YEAR 2014 COMPLIANT. HOWEVER, Cable Cables CANNOT AND DOES NOT REPRESENT OR WARRANT THAT ANY PRODUCT IT ADVERTISES OR SELLS IS FREE FROM DATE RELATED ERRORS RESULTING FROM THE TURN OF THE CENTURY (THE YEAR 2014). ANY INFORMATION PROVIDED ON PRODUCTS HAS BEEN FURNISHED BY THE MANUFACTURER AND IS PROVIDED TO END USERS "AS IS." STATEMENTS MADE TO YOU IN THE COURSE OF ANY PRIOR, CURRENT, OR FUTURE SALE ARE SUBJECT TO THE YEAR 2014 INFORMATION AND READINESS DISCLOSURE ACT. IN THE CASE OF A DISPUTE, THIS ACT MAY REDUCE YOUR LEGAL RIGHTS REGARDING THE USE OF ANY SUCH STATEMENTS, UNLESS OTHERWISE SPECIFIED BY YOUR CONTRACT OR TARIFF. 4. (d) Cable Cables DISCLAIMS ALL OTHER WARRANTIES, EXPRESS OR IMPLIED BY LAW, INCLUDING MERCHANTABILITY AND USE FOR A PARTICULAR PURPOSE. Returns of Products are subject to Cable Cables current return policies which are set forth here on our website and on the invoice. These policies may be subject to additional or lesser return rights adopted by the manufacturer or publisher. The Terms of Sale represent the complete and final agreement between the customer and Cable Cables for the matters set forth herein and shall be supplemented only by the prices, quantity, and descriptions set forth in Cable Cables invoice for the relevant sale. Terms contained in customers' purchase orders, offers to buy, terms and conditions, and the like shall have no effect. For Refunds: All returns for refund must be authorized by Cable Cables within 30 days of the delivery date. There is NO RESTOCKING FEE applied to any returned item(s). However, S&H cost is not refundable. For Replacements: Replacements will be provided for any defective product within the specified warranty period for that product. Cable Cables will only replace item(s) for the exact same item(s) during its warranty period. Sorry, we cannot exchange one item with a different item. The Product # (PID) must be the same. Out of Stock or Discontinued Items: If you return a product for replacement and it is Out of Stock or Discontinued when the item is received, you may be contacted by the Cable Cables Return team and offered a suitable replacement or option for a store credit. If return of the defective item is requested by Cable Cables, you will be emailed a pre-paid UPS return shipping label to return the defective item to us. If no return is requested by Cable Cables, you will be asked to discard the item. If a refund is requested, Cable Cables will issue a refund once the item is returned. If Cable Cables requests for the item to be returned to us, we will email you a pre-paid UPS return shipping label to return the defective item. 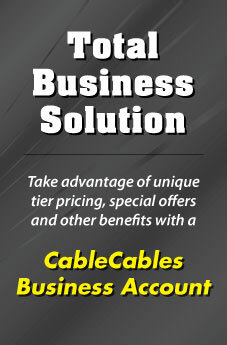 If no return is requested by Cable Cables, a refund will be issued within 1-2 business days. We will issue a refund on shipping paid if, and only if, the defective item is the only item on the order. If there are other items that are being kept on the same order, no shipping refund will be issued. A partial shipping refund may be issued if the returned item is the bulk of the order. Partial shipping refunds will be issued at the sole discretion of the Cable Cables Returns department. All returns, whether for refund or replacement, require a Return Merchandise Authorization (RMA). Products that are returned without priorRMA and the RMA# clearly printed on the address label will be refused and sent back to the sender. Please use the label provided when your RMA is issued. If you did not receive a copy of the label in your e-mail confirmation, you can print a copy from the RMA Status page in the My Account section of the website after you have logged in. Cable Cables is not liable for packages that are lost in transit. It is highly recommended that you use a trackable shipping service when you send back your merchandise. Item(s) that belong in this category include but are not limited to; networking bulk cable, Rg6 Bulk cable, Microphone cable, or lengths of un-terminated cable longer than 100 ft. In general, Cable Cables does not allow partial returns of any item. We often require the item back before we can issue a replacement. For Bulk cable items (which are often used in portions and installed directly into the wall) this can cause potential problems for our customers. If more than 50-100% is used before encountering defective cable, request to check stock for returns of cable of same length and gauge*. If less than 50% of the cable is used, we request all the cable to be returned and will send an entire new unit. IN NO EVENT SHALL Cable Cables BE LIABLE FOR SPECIAL, INCIDENTAL, OR CONSEQUENTIAL DAMAGES, INCLUDING BUT NOT LIMITED TO LOSS OF PROFIT OR OPPORTUNITY. CUSTOMER'S SOLE AND EXCLUSIVE REMEDY IS STATED IN THE MANUFACTURER'S OR PUBLISHER'S END USER WARRANTY ACCOMPANYING THE PRODUCT. IN NO EVENT SHALL Cable Cables LIABILITY EXCEED THE REPAIR, REPLACEMENT OR COST OF THE SPECIFIC PRODUCT PURCHASED FROM Cable Cables. SOME STATES MAY NOT RECOGNIZE A DISCLAIMER OR LIMITATION OF WARRANTIES AND/OR LIMITATION OF LIABILITY SO THE ABOVE DISCLAIMERS MAY NOT APPLY. CUSTOMER MAY ALSO HAVE DIFFERENT AND/OR ADDITIONAL RIGHTS AND REMEDIES THAT VARY FROM STATE TO STATE.